“Get wisdom, get understanding, though it cost all you have” Ecclesiastes. Like many students, I undertook an Arts degree as a result of not knowing what it was that I really wanted to do. I fell into banking and soon discovered that I had a talent for growing businesses and in organisational transformation, which would lead to a number of different positions with ANZ. I was building up the experience necessary to head a department or business whilst at the same time getting known in the organisational transformation field, when an opportunity came up in the UK with the introduction of Euro Currency. It was exciting to get to see a whole new market formed, watching different treasuries and banks working out how they are then going to operate in this space. Seeing businesses have to start from scratch for the first time sparked my entrepreneurial spirit by, I was also a consumer during my time in the UK and quickly learnt that the UK was far more advanced in the digital space than Australia at that time. Upon arriving back in Australia I realised the ability to use the digital world here was greatly limited, we were about as advanced as being able to download a PDF Target catalogue, which was surprising given Australia has always been known for being an early adopter. I saw the potential of the space and started ANZ’s digital car loans long before the online world had become ‘cool’ for the use of commerce and trade. I then watched what was happening to consumer behaviour, I ended up running digital channels as my penultimate job with the ANZ prior to joining World Vision, what drove our success was relentlessly removing friction from the customer experience. Like many people who join World Vision, I was approached by them by way of a phone call as it was not something that I had previously considered. It was the first time in my career that I had been approached for a position, they called me and told me that there were a number of people on their board who wanted to get me involved. To be honest I had to really think about whether to take the job or not as I wasn’t actively looking for a new job. I took a career break when my youngest child was about to start school, prior to this I had only taken short maternity leaves and I felt as though I was missing out on their childhoods. It was during this break that the opportunity to chair the not-for-profit board arose, it allowed me to keep my hand in the field and to learn how to be a director whilst being able to spend more time with my children. I joined the board in 2007 and have just come off it now, during which the organisation underwent a leadership transition and a move into the digital world. I look at the not-for-profit sector in two parts, firstly in terms of the field where our resources are so scarce that we can not afford to duplicate the work we are doing in the field, and secondly in terms of the fund-raising space where although it is very crowded, it comes down to how you get your message out. It is my job to lead World vision into a new conversation with its supporters about their confidence in being change makers given there are myths around that millennials aren’t interested in social causes, what is changing is that the impact that they want to have needs to be bigger and greater. We are leading out a new brand message about being change makers and about the ways that people can connect with World Vision to make significant changes in the lives of children around the world. When I was working in banking, we would often refer to the ‘barbeque test’ where you are telling a stranger what you do for a living because obviously, we would get stuck in some difficult conversations. When I tell people that I am the CEO of World Vision the most common response that I get is a massive smile and a look of excitement on people’s faces, people will commonly ask what part of the world have you changed today? What underlies such questions is the fact that we have a real clear purpose, working with at team is great as we don’t need to focus on the why, instead we can focus on the what and how to get this done. Early in my orientation I wanted to go out into the field as I can’t speak with authority to the supporters about what is happening in the field, without having experienced it first-hand. I spent some time in Myanmar, where I obtained personal experiences of how World Vision actually supports communities and grows leaders rather than coming, spending money for a limited time and then disappearing. One of the community programs we run are Savings & Loans Clubs, whilst in Myanmar we went to see a group of women who were running the club in their area and they were proudly showing us their box of ledgers and loan details with all the padlocks on it, they were so proud of the role that they were playing within their community. You get the real sense of sustainability from these types of programs. I have also been to some of our programs in parts of Columbia where there is a really strong peace building movement, the children are teaching other children to participate in peace programs. The emerging leaders are coming through with a mindset of peace and cooperation as opposed to the one of conflict, violence and corruption that is so embedded in the older generations. One of the things that surprised me was that I did get a scholarship, the Helen Schultz scholarship, which is aimed at supporting women completing the MBA. I had to negotiate intensely with my employer to allow me to complete my MBA, their approval did not come through straight away as they had only funded very few, if any, women through their MBAs. The scholarship was very helpful in getting me support, there is a community associated with the Helen Schulz scholarship trust, they have dinners and social events to catch up with other recipients which provides for a great network. I have always been of the view that if a man can do a job then so can I, I have always been about pursuing opportunities that match my skill sets and getting the opportunity to shape businesses. Anything that suggests that a job only suits male characteristics, I will always challenge. The digital area is probably what shocked me most when I discovered that although it is improving now, there is still quite a clear prejudice in the digital space and the Silicon Valley stereotype of the young sexist male starting the big digital start ups still exists. There are many women who have tried to have a go in Silicon Valley but have found the old school attitudes still exist amongst this new generation which you wouldn’t expect. To champion women going into the digital sector is in some ways more important than in the corporate sector where the transformation has been underway for some time. The digital sector doesn’t have that long history or enough advocates for the involvement of women in top level positions. Springboard is a program that has come out of the US which now has a chapter in Australia, it is aimed at encouraging women entrepreneurs in the tech, science and health sectors and educates them in different areas. The hope is that one day we won’t need these special women’s programs but at the moment there is a need to equip women so that this can become the reality. The first principle that I have learnt, which I didn’t start out with, is to ask for what you need. A personal example of this for me is when I moved to London with the ANZ and I became pregnant with my first child, whilst being head hunted by another bank. With great trepidation, I thought I had to resign because I had a child, I decided that I should talk to my manager about my situation as I had nothing to lose. To my surprise, they said yes to a pay rise and yes to being able to work part-time from home, I was very fortunate to have had an enlightened boss who although belonged to the older generation, didn’t hold old fashioned views. If I had just walked in and resigned as I had been thinking of doing, I wouldn’t have ever known that being able to work part-time and from home was an option. It was only because I told my boss what the situation was, that he was able to come back with the support that I needed. You need to ask the question as even if you get a no, you will then get to understand why the answer is no or if there is a way to work around that. Most of the jobs I have had I began by me approaching the right people in that company with the problems that they are facing and then offering them with the solutions that my skill set could offer them. Whilst it is a more risky strategy, I have taken short term roles and uncertain assignments because I have backed myself and they have always turned into long-term jobs. One of the habits I utilise in all my jobs is one of trying the product that you are selling, there are not enough companies where the leaders or directors of the board will actually go and be the consumer of their product, if they did they would realise the level of friction involved in the experience. At World Vision we recognise that we have a level of friction in our customer experience and one of our main focuses is addressing its different causes, if you look at the companies that have exploded in recent times it is those who have been able to remove or reduce the level of friction at different stages of the experience. I went out recently and experienced as a consumer one of our new programs which utilises 3D technology to display the fields within shopping centre stalls. It was the food distribution program that we were trialling the 3D technology on, just before Christmas at a time where we all go out and buy lots of lovely rich food, here were these people collecting staple ration packages of grains and pasta. It was quite moving to see this in the context of our own lives in a way that is not shouting or driving a guilt reaction, but in a way that helps us to recognise just how much we have. My other habit is to read as widely as I can, personally I do this through social channels where you can now find content that you would never have been able to find through the traditional channels. There are a couple of themes I focus on particularly, being leadership and innovation. I use google alerts, follow influential people in the sectors that I am interested in and find that often people will share with me the type of content that I am interested in. I recognise that there is the risk of only seeing what you want to see, but this is where I get most of my knowledge about leadership and tech from. The quote is from a book of the bible called Ecclesiastes which says ‘get wisdom, get understanding though it cost all you have’. This has been a significant insight into being a good leader, as the temptation is so easily and readily there to try to be the hero and to ‘save’ the situation as this feeds our ego. While there are times that leaders do need to step in, if we do that without wisdom and without understanding then it is unlikely to be successful. For me it epitomises curiosity and wanting to understand the subtext and where people are coming from before implementing change. Although I am not perfect at this, it is an inspiration and aspiration because I know if I am not thinking like that then I cant be as successful a leader. 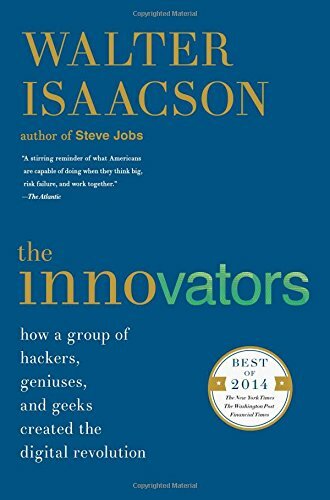 Walter Isaacson’s The Innovators is a great read as it is a compilation of stories of different but significant innovators over the last 200 years or so, starting with the mathematician Ada Lovelace at a time when women were not involved with science or technology. This has been a great inspiration to me and has helped me in some ways to articulate my own story. Worldvision.com.au is where you can catch up with our latest programming, the one I would like to highlight at the moment is one of digital innovation that we have in the field. We were a finalist in the Google Impact Challenge for this programming, which is fire alarms for slums in Bangladesh where traditional smoke alarms will not work because of all the open stoves and cooking fires. This is a smart alarm that recognises fire from heat and sends a message to all mobile phones in the area to warn them of the fire. People can get all the information about how to get involved in our programs or how to get in contact from our website. They can also follow me at my twitter handle @ClaireSRogers.